While the HoverCam Ultra8 can be used for a variety of complex tasks, it's primary function is to be used as a regular document camera. 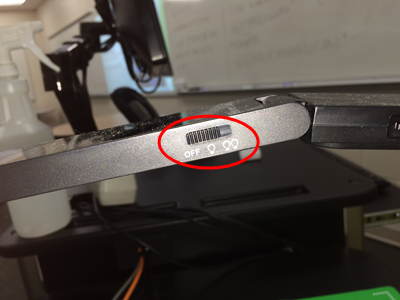 Below are instructions on how to solely use the Ultra8 as a document camera. This does not require the use of the Flex10 software. 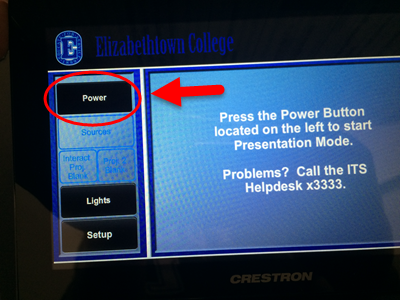 Step 1:Turn on the Crestron System by pressing the Power button. Press the power button directly on the Ultra8. 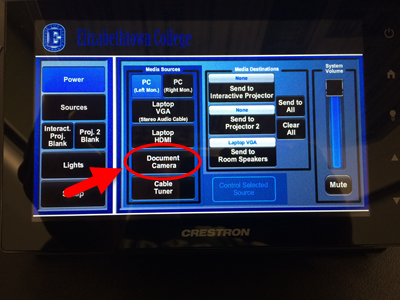 Note: Occasionally, when you turn on the document camera by pressing Document Camera on the Crestron screen, the Ultra8's screen will turn on briefly, but then suddenly turn off. If this occurs, continue to press either the Document Camera button on the Crestron screen or the power button on the actual Ultra8 until "Hovercam" displays on the Ultra8's screen, followed by "Ultra8". Step 3:Press Send to All. 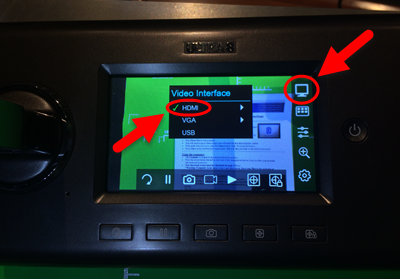 Note: If no image displays on either projector screen, check to see if the Ultra8's video interface is set to HDMI. Change the Ultra8's video interface by pressing the monitor icon in the upper right corner of the UItra8's screen and selecting HDMI. 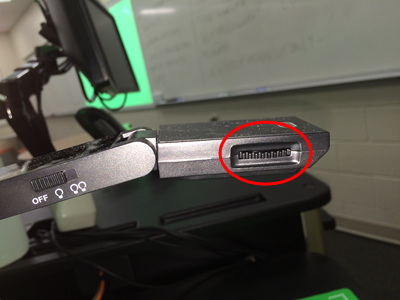 All of the document camera functions of the HoverCam Ultra8 can either be controlled by using the Crestron touch screen, or by using the buttons directly on the Ultra8. 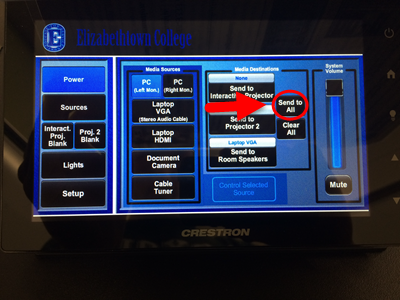 Via the Crestron PanelTo begin using the camera functions, press Control Selected Source. 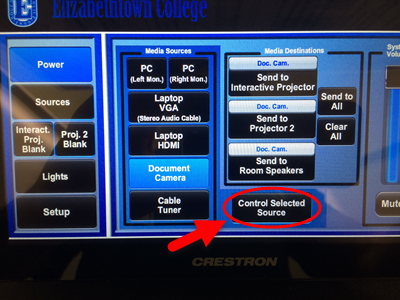 Once you've positioned your document to your liking, you can use the document camera controls to zoom in and zoom out, move the frame left or right as well as up or down, and rotate the image. Press Zoom In to incrementally increase the magnification of the projected image. Press Zoom Out to incrementally decrease the magnification of the image. Press either Up, Down, Left, or Right to slightly adjust the positioning of the image vertically or horizontally. 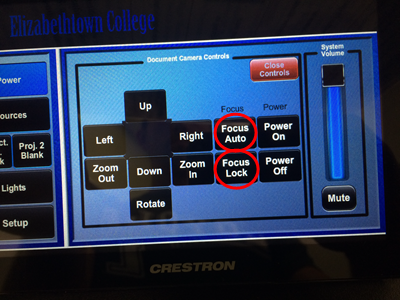 The camera should focus the image automatically, but if not, press either Focus Auto or Focus Lock to adjust and lock the focus setting. Press Rotate to flip the projected image 180º. Note: You can spin the indicated dial located on the Ultra8 to rotate the projected image 90º. 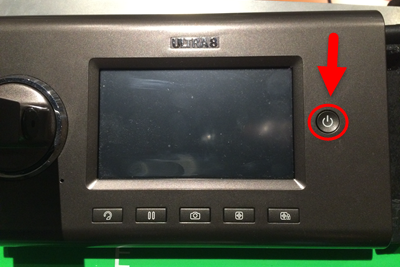 To use the built-in light on the Ultra8, flip on the indicated light switch. Most of the camera functions that are found on the Crestron's control panel can also be found on the Ultra8 panel. 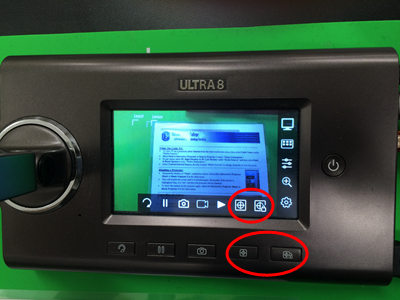 The Ultra8, however, has a few more functions that the Crestron panel does not have. Adjust and lock the focus of the camera with the any of indicated buttons. Adjust the zoom of the camera with the zoom icon. 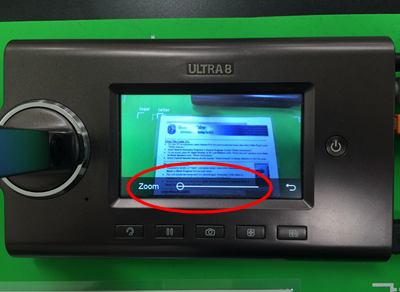 After pressing the zoom icon, slide the dial right to zoom in, and slide left to zoom out. 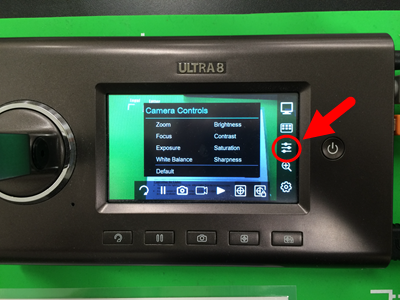 Press the Camera Controls icon to adjust the coloring of the camera's image. Press either of the camera icons to take a screenshot. View any screenshots that were taken by pressing the indicated icon. Press either of the rotate icons to flip the camera's image 180º. For more information, visit this YouTube video.